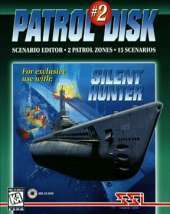 The second add-on disk to the submarine simulation Silent Hunter features similar content as the first: there are two new patrol zones for the career mode (the waters near Hong Kong and Vietnam) and 15 new scenario missions: Sea Dragon Smacks a Convoy, The "Up the Kilt" Shot, Waiting for Bigger Game, Bowfin's Big Surprise, Lapon Tours Hong Kong, Lapon Strikes Again, Tanker Fishing, Guardfish Strikes Gold, Long Odds, Flasher vs. Oi, Flasher's Last Score, Barb Takes on Everyone, Rasher vs. Taiyo, Last of the Marus, Convoy Attack. There is also an entirely new feature - a scenario editor. It allows the creation of a multitude of missions. Any patrol zone can be used as the setting. Submarines, military and trading ships and aircraft can be freely placed. Many variables can be set: weather, time of day, experience of ship crews and bomb load of aircraft. The pre-existing scenarios can be loaded into the editor and changed as well.